Moving along with our continuing travelogues, we'll jump to August (see, we're catching up!) and a trip to Summerail at CUT. Summerail is the big multi-media railroad photography exposition held inside Cincinnati Union Terminal (a place that used to see hundreds of trains a day but is now reduced to only seeing Amtrak run one train each way three times a week). Organized by David Oroszi of Dayton, Ohio, Summerail brings together some of the finest photographers from the heartland and across the country. 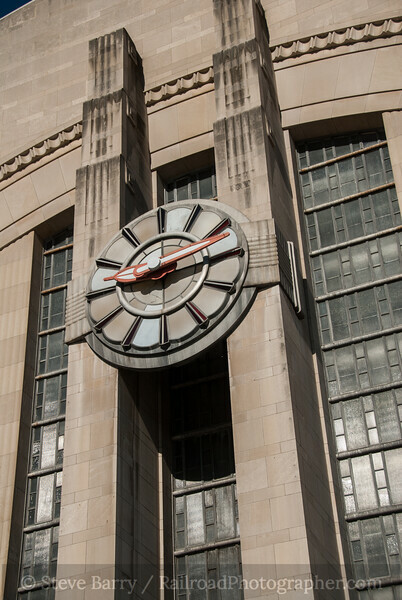 Cincinnati Union Terminal, built in 1933, is an art deco masterpiece, and the last of the great stations built in the U.S. before the decline of passenger trains as America's premier transportation mode. Other than a brief sure in traffic during World War II, the number of trains calling at the terminal was in decline almost as soon as the station opened. By 1971 Amtrak was down to two trains a day stopping at CUT, and Amtrak pulled out altogether in 1972. The building sat empty until 1980 when a shopping mall was opened inside it. By 1982 the building was empty again, then in 1990 it opened as its current incarnation as the Cincinnati Museum Center. Amtrak returned to the terminal in 1991. Summerail is held in the Museum Center's theatre, just off the grand half-dome rotunda. I headed west with Railfan & Railroad associate editor Otto Vondrak on August 9, driving straight through from New Jersey to Cincinnati. 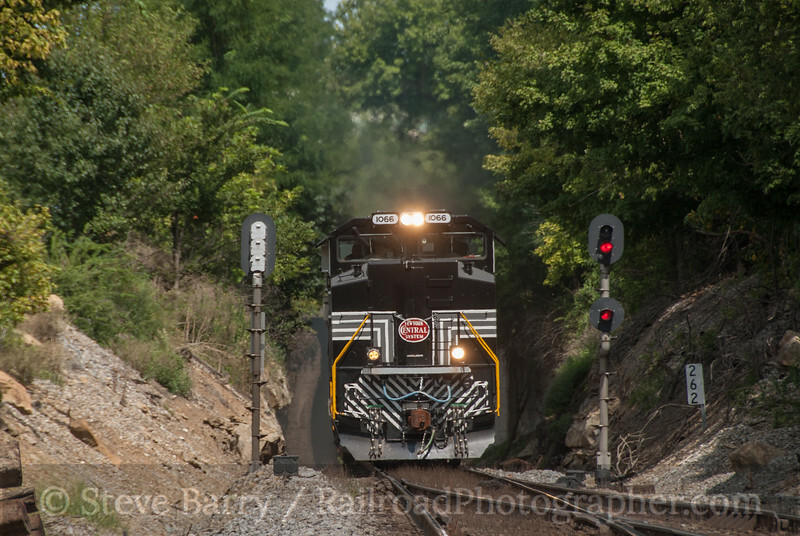 On August 10 we did some railfanning with local guide Willie Davis before heading to the traditional Friday evening meal at Camp Washington Chili, followed by an evening of slides in the CUT theatre. Saturday, August 11, was the big day for Summerail. I spent the morning in Tower A located in the upper reaches of CUT. At one time Tower A controlled all the movements into and out of CUT; today it is operated as a museum by the Cincinnati Railroad Club. 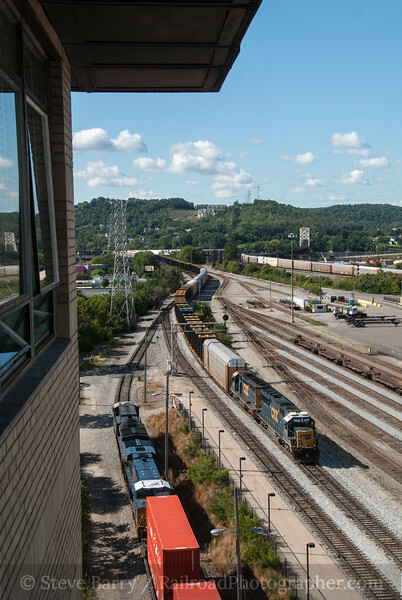 The tower provides a panoramic view of CSX's Queensgate Yard and Norfolk Southern's Gest Street Yard. To the south, the NS's ex-Southern Railway bridge into Kentucky is visible in the distance. A handful of trains from both CSX and NS came into the yard during my two hours there. The multi-media shows were all tremendous -- one of the best line-ups of shows I have ever seen at Summerail (and I've been there every year since 1999). Dinner was the traditional Skyline Chili meal across the Ohio River in Covington, Ky., then more shows took us late into the evening. The next morning Otto and I loaded up on supplies (cans of Skyline Chili, bottles of Ale-8-One, and more) then headed into Kentucky to shoot the Short Line of the former Louisville & Nashville (now CSX). 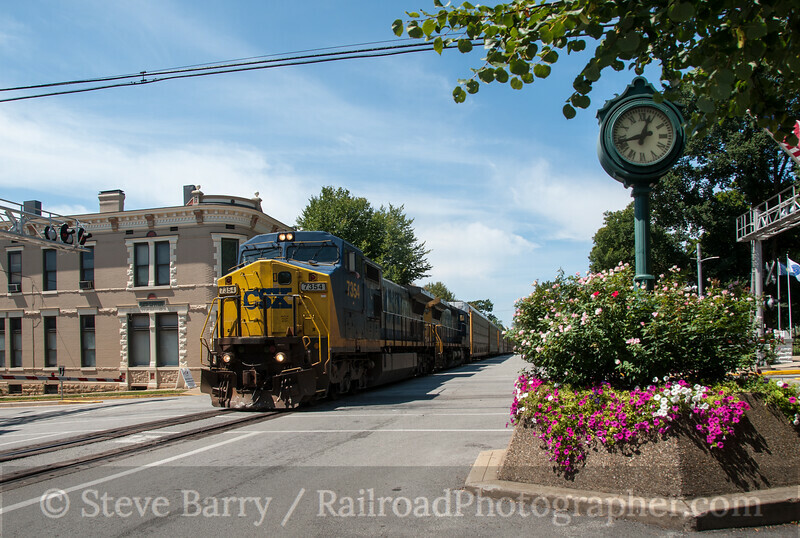 In LaGrange CSX trains share the main street with auto traffic (the street running has become the town's biggest tourist draw) and we got one train each direction there. There was quite an assembled throng of photographers in town, and while most shot an eastbound train from the sunny side at the east end of the street running, I opted for a more unconventional angle passing the town clock. 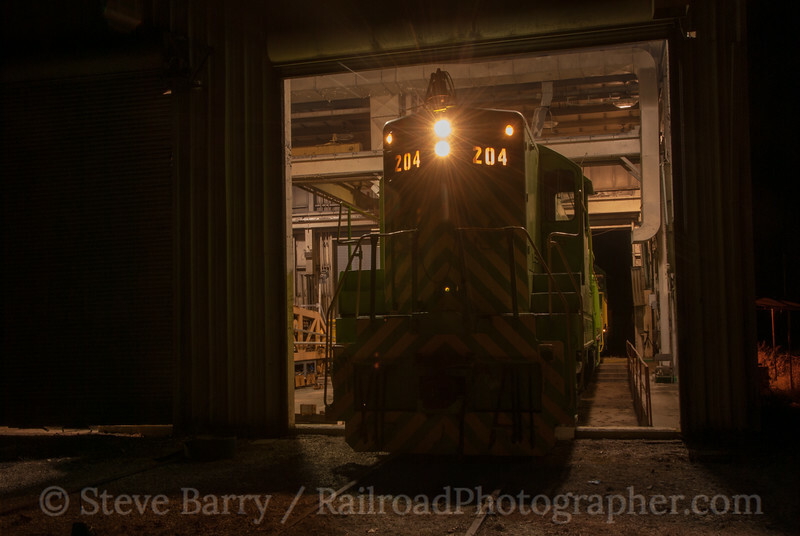 We needed to head further west for a night photo session in southwest Indiana, and the intel was that a Norfolk Southern heritage unit (No. 1066, painted for the New York Central) was working in helper service out of New Albany, Ind. 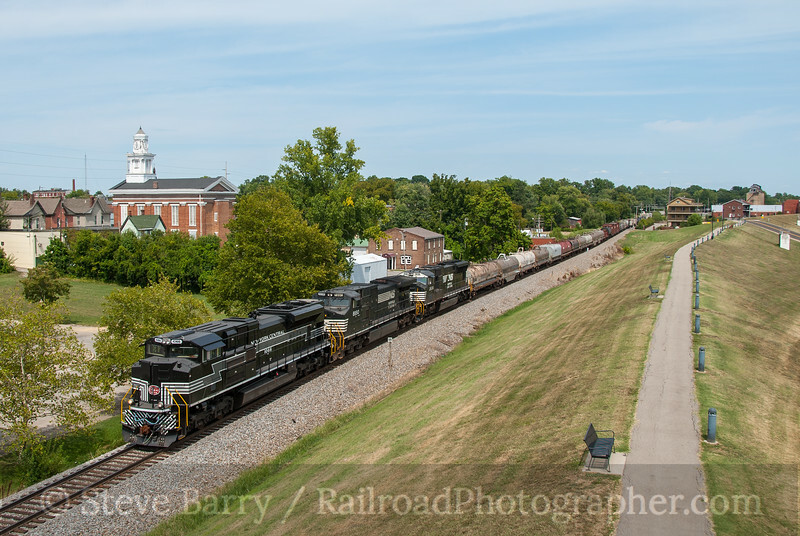 Even though the heritage unit would be facing into the train while pushing, we decided to check things out and headed to New Albany. Much to our surprise, a young railfan there informed us that the next westbound train had locomotive trouble, and the two engine helper set (the heritage unit and one other engine) was going to be split up, with the NYC engine assigned to the point! We couldn't believe our luck! However, I am not going to show you any shots of that chase for reasons that will soon become clear. After a spectacular chase across Indiana, Otto (who is not into night photography like I am) opted to stay at the motel while I headed out to Boone, Ind., and the Squaw Creek Southern for a night photo session organized by Mark Mautner. I hadn't downloaded any of my photos so far on this trip to my computer and my digital cards were filling up fast. I had to pause twice during the night photo session to change cards, and during the first of those changes I took out the card containing the NYC heritage chase and unknowingly dropped it (I would not discover this until I was back home in New Jersey and found a gap in my photos). 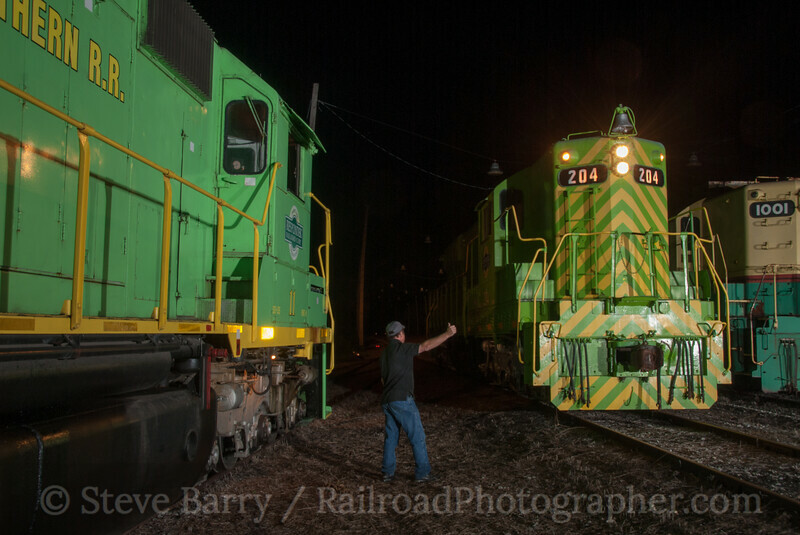 The Squaw Creek Southern is operated by Respondek Rail, and company president Terry Respondek posed for one of the scenes giving a thumbs-up to his locomotives. Most of the night photo session was done with plenty of flash, but during one of the equipment moves I took advantage of the existing light at the shop and captured SD9 No. 204 poking out the back silhouetted by the shop lights. The next day, August 13, we rocketed back home to New Jersey. Once there, I downloaded all my photos and noticed everything from the NYC chase was missing. I immediately knew where I had dropped the card -- in the Squaw Creek Southern yard -- and I pretty much knew where I was standing when I likely dropped it. However, my card was now 800 miles away. What to do? After some thought, I remembered that Carstens Publications had an employee living in central Illinois about 200 miles from Boonville. In my capacity as editor of Railfan & Railroad, I "assigned" him a day of work to go down to Boonville and track down my card. After about a week of it lying on the ground, Jim Wiggin was able to find the card, right where I dropped it. He mailed it back to New Jersey, I loaded it into the computer, and -- voila -- I had my NYC shots back. 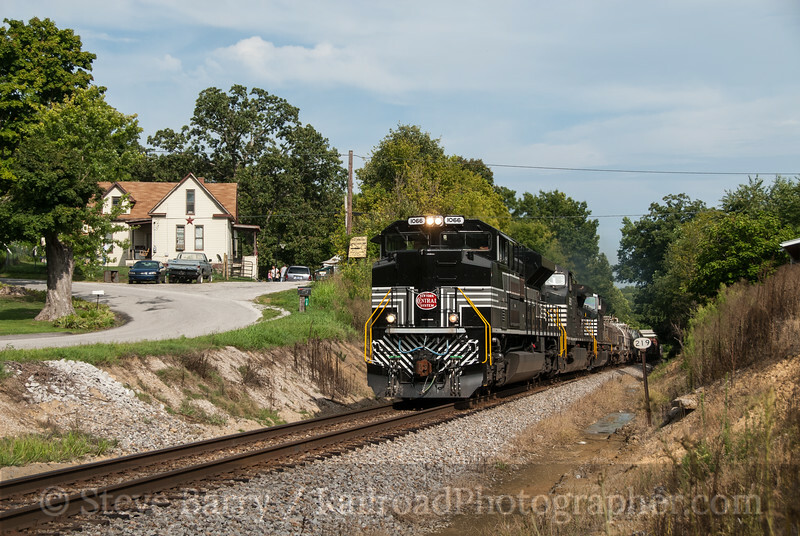 So let's review the chase -- it started with a scene at the levee at New Albany, Ind., as more and more railfans gathered as the afternoon progressed. While most of the photographers followed the train for some extra shots, Otto and I decided to head directly to the tunnel at Maplewood, Ind. Good thing we did -- there was room for about five photographers comfortably. As the train popped out of the tunnel, the rest of the motorcading photographers jockeyed for position as 20 people tried to fit into the space that would accommodate about three. We would continue along this ex-Southern Railway mainline on the way to Huntingburg, getting several fine photos along the way. About the time we were ready to break off the chase, I noticed we were only a few miles from Eckman. I had chased a freight through Eckman back in 2010 and knew it was a good shot, so we made our last stand there. From here it was the night photo session and back to New Jersey. What was an adventurous trip turned out to be a little too adventurous for my tastes, but thanks to Jim Wiggin it had a happy ending.